This is little boy Marcus. He just arrived yesterday from Minnesota. Marcus is the baby brother of Farcus, Festus and Basock Obama. 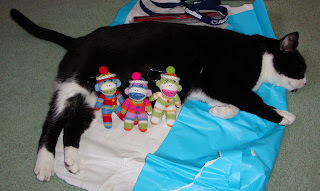 All four were made by the same talented sock monkey mother. Marcus is strutting his stuff already. He can't wait to meet his big brothers! What a handsome family portrait! 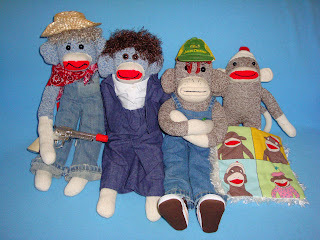 From left to right, we've got Festus the cowboy sheriff, Basock Obama the president, Farcus the red headed bully and little Marcus with his sock monkey blankie. Note: Farcus has been very well behaved since he moved to Florida and is no longer a bully. Marcus gives Basock a big hug. Festus says, "I'll protect you, little brother." Marcus asks Farcus to tuck him in at bedtime. These two have bonded since their names rhyme. This is my new friend, Jocko Janoski. He is a fellow Pittsburgher who just moved to my house recently. 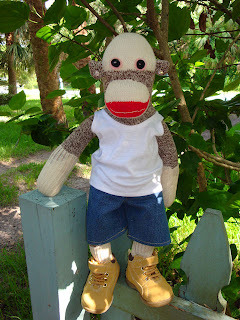 I took Jocko to the park today to get familiar with his new surroundings. 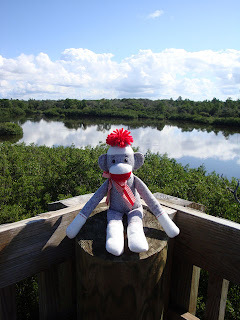 I'll be posting more pictures from our park excursion in a few days. Meanwhile, let me explain how Jocko got his last name. 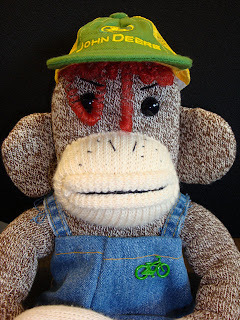 Mark found Jocko at Janoski's Farm Market in Clinton, PA a couple of weeks ago. Here's a picture of their entrance sign. 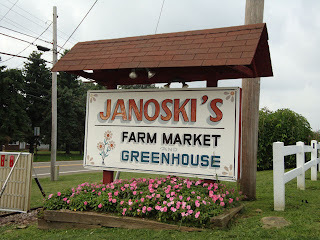 Janoski's offers the best fresh produce, and has a fully stocked gift shop... with sock monkeys available for adoption! Jocko cried out to Mark, and he answered the call. 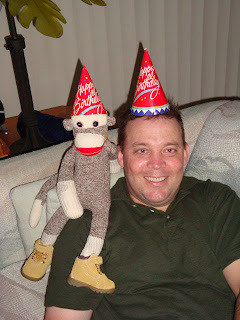 Little did Jocko know that he just hit the sock monkey jackpot when Mark brought him back to Florida. 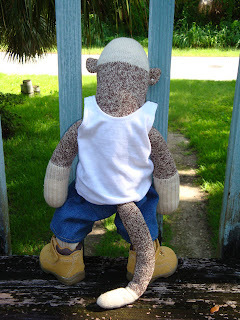 Goodbye, Pennsylvania (for now), and hello Big Monkey's House! 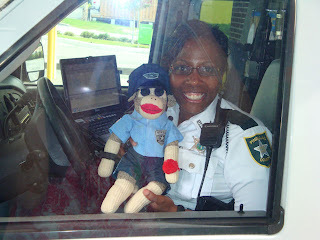 This is a follow up post to Officer Po Po's last appearance at the bank for Sock Monkey Friday (see post dated 7/31/09). 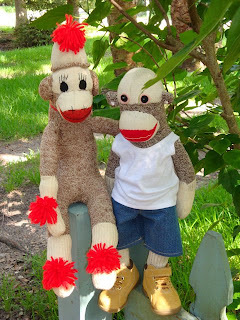 Finally, after much planning Officer Po Po and Deputy Edith have their picture taken together in uniform. I couldn't tell which one of them was more excited for this moment. 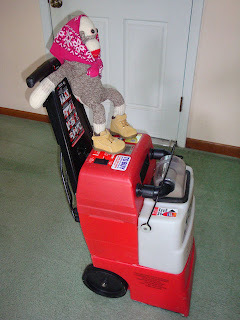 Deputy Edith was off to work, and she promised to coordinate with Po Po on any difficult cases in which the Sheriff's Office might benefit from his wealth of expertise in law enforcement. 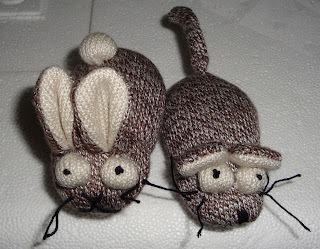 Meet Sock Mouse and Sock Bunny. They were recently adopted via Pet Supermarket this week. These cute little fellows are cursed though. Their bodies are filled with catnip, and they're about to be introduced to the King of the Domestic Feline Jungle... Karl! Uh oh! We're in deep trouble, aren't we? 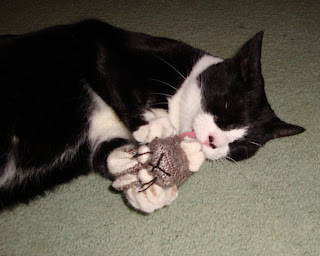 Sock Mouse was the first victim. Karl attacked without mercy. Behold his majesty's sharp talons and razor-like teeth! 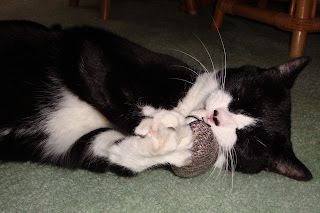 Alas, Sock Mouse will never be the same. 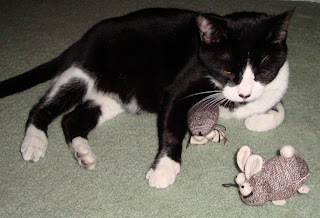 After Sock Mouse was defeated, Karl noticed Sock Bunny hopping nonchalantly across his path. 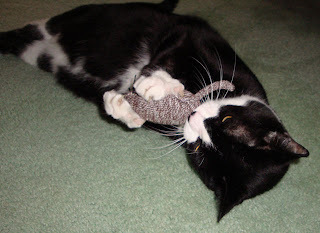 With one swift paw strike, Sock Bunny was captured by Karl. 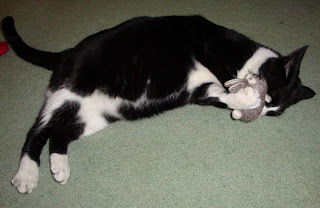 Karl savored Sock Bunny's catnip filled body. Check out that pink tongue! 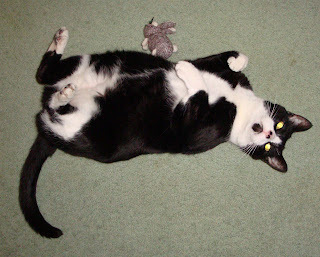 After his victory over mouse and bunny, our savage beast wallowed in his own catnip induced glory. 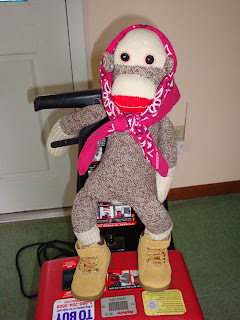 Stepford Monk or Desperate Housemonk? You Decide. 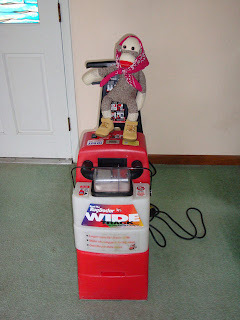 Earlier today, I took on the ambitious project of steam cleaning the carpets. 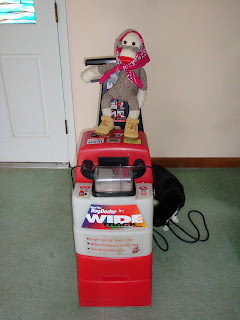 I am affectionately renaming this fine Rug Doctor machine the Beast from Hell. You may wonder how the term "curiosity killed the cat" originated. I think it might have been when a fearless tuxedo cat starting sniffing around the Beast from Hell. Karl nonchalantly strolls right in front of the Beast's path. Brave boy? Think again. I hadn't even fired up this Beast yet. Here I go. Rollin' rollin' rollin'. Keep that Beast a rollin'... Rawhide! No tuxedo cats in sight now... ha! Whew! I really worked up a sweat today, but it was totally worth it. 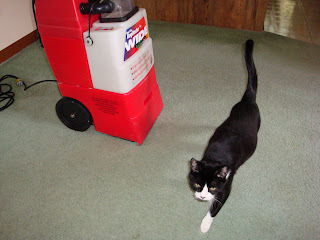 The carpet is now fresh and clean for my humans. I sure hope they are grateful for all my hard work this morning. 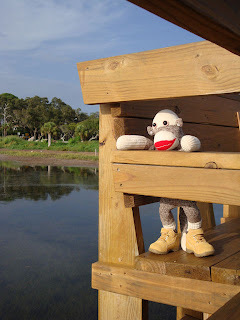 I am waiting patiently for Laura to return from our grocery store, Publix. She is bringing home a new family member for me today. 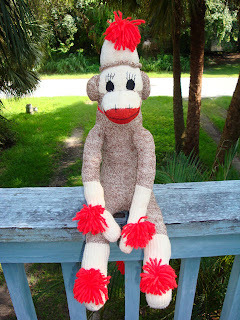 Our friend Carla, who works at Publix, has generously allowed us to adopt her daughter's childhood sock monkey. Hurry home, Laura. I want to play with my new pal. She's here! Her name is Matilda, and she is in wonderful condition for her 30+ years. I think we're going to get along splendidly! I gave Matilda a tour of the yard, and she especially enjoyed the view from our deck. 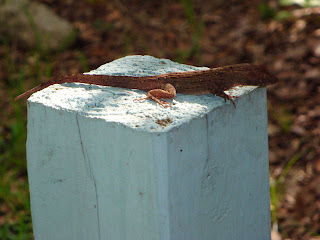 While we were playing outside, we made a lizard friend. I hear my pals calling from inside the house, so I better take Matilda to meet everyone. What a wonderful end to the weekend. Here's to the start of a beautiful friendship! "Hurry up, Laura!," Farcus exclaimed. 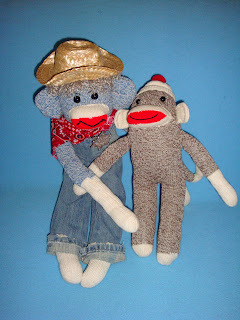 "It's time for Sock Monkey Friday to begin." 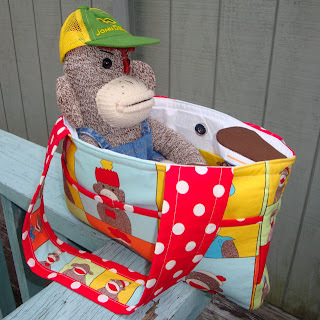 Farcus prepared for his journey to the bank by hopping inside his "monkey pod." 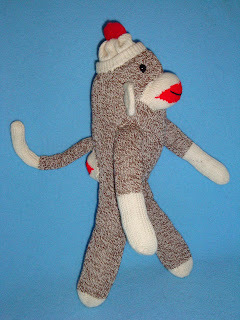 His pod can also serve as a sock monkey purse for humans. 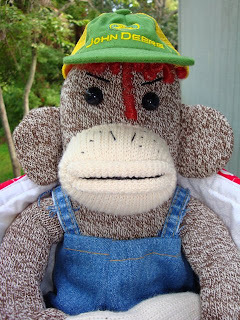 Farcus donned his favorite hat advertising his favorite tractor - John Deere! 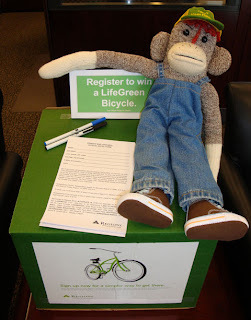 Farcus spent a good part of his day encouraging folks to fill out an entry for a chance to win a brand new green bicycle. Farcus' efforts were rewarded when he received this cool green bike pin! I know it's hard to tell, but he was pretty excited about the pin. 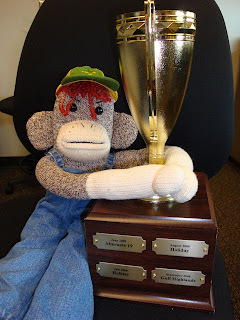 Farcus hugged the traveling customer service trophy. Our branch was #1 in the region during the month of June. 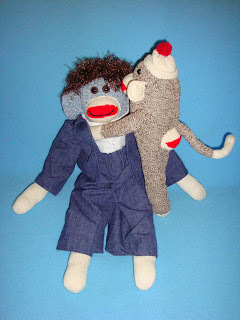 I'd like to think that sock monkeys working on Fridays helped contribute to this awesome accomplishment. 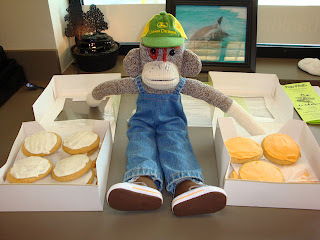 The girls at the bank can't get enough of these J.J. Gandy's cookies lately. When no one was looking, Farcus took a nibble of the key lime and orange cookies. 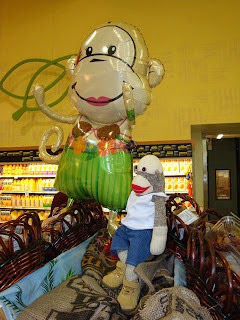 This past Sunday I tagged along with Laura for the weekly shopping at our favorite grocery store, Publix. We were going to pick up a new family member from our friend Carla who works there. 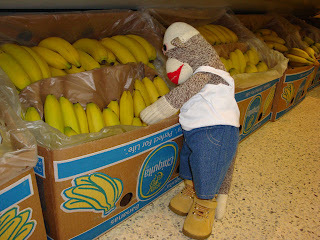 She mistakenly left the sock monkey at home, but I still enjoyed my trip by invading the produce section. 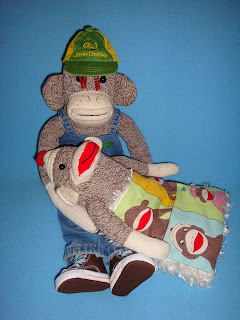 Ahhh... this is every monkey's dream. Check out these bananas! Can I bring them ALL home... please? I think we need a bigger cart. 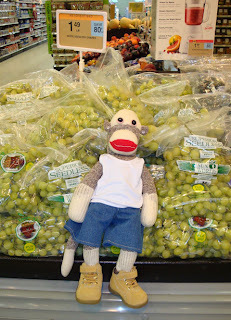 Besides bananas, I am a big fan of grapes. Laura usually gets the seedless variety, but I like the ones with seeds so I can spit them at Mark when he's not looking... hee hee! Hey, this hula chick looks familiar. 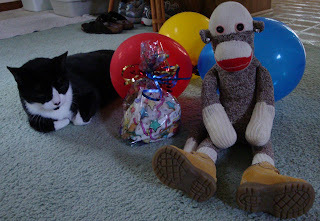 I think she came to Laura's birthday party. 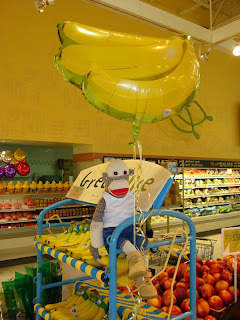 Publix is definitely a monkey friendly grocery store. Can I buy this banana balloon, Laura? I never realized grocery shopping was so much fun. I think I'm going to be back at Publix again real soon. Saturday was a special occasion at our home. 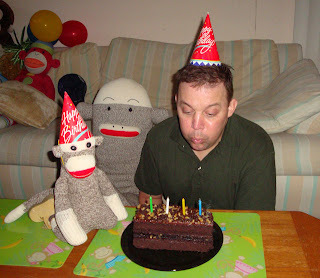 Coincidentally, Mark and I celebrate the same birthday. We received some special cookies (an assortment of key lime and chocolate chip) from our friend Cynthia. 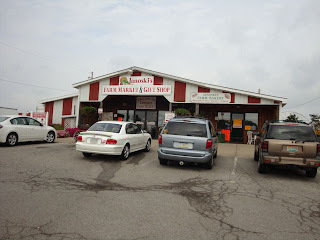 They are from J.J. Gandy's, which the locals know as one of the best places around for desserts. Karl doesn't want any cookies, but he couldn't resist being part of the festivities as usual. 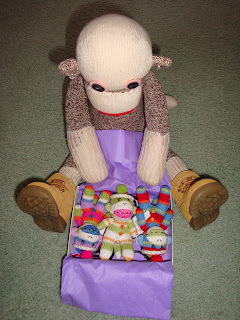 Look what I got - three baby striped sock monkeys! Aren't they cute? The babies immediately made friends with Karl. He looks like a mother cat in this picture! 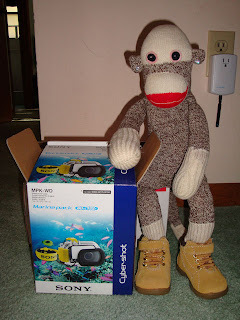 Here's the present I got for Mark. 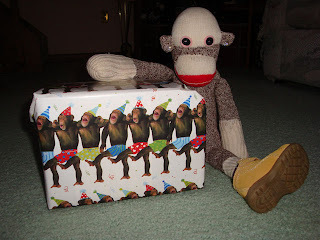 I think he'll be impressed with the wrapping paper alone - dancing birthday chimps. 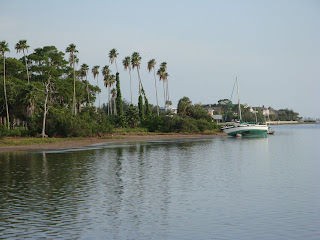 After our birthday dinner at Ozona Blue, we took a drive down to the waterfront at Crystal Beach. It was a little too early for sunset, but it was nice because we had the pier to ourselves for the most part. While I was checking out the view from this bench, some folks with a small dog walked past us. Apparently their dog had spotted me from a distance and started growling! 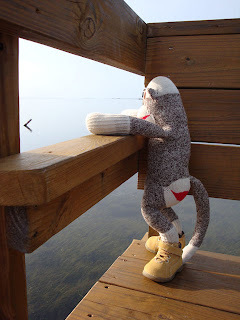 I'm enjoying the tranquil view of the Gulf from my vantage point. 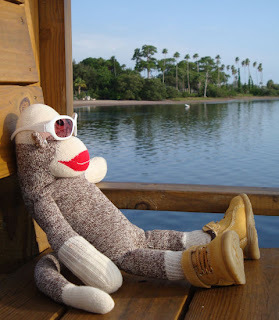 We walked down to the end of the pier and just relaxed for a bit. You can see the shoreline of Crystal Beach in the distance. Here's a closer look. There was a large green and white sailboat washed ashore because the tide was extremely low. Although I could sit here for hours enjoying the view, there's a chocolate cake calling me back home right now. 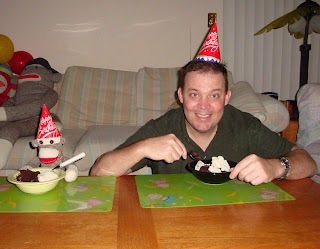 It's a requirement in our house to wear a cone shaped hat on your birthday, whether you are a human, cat or sock monkey. Mark made a wise choice for the birthday cake. 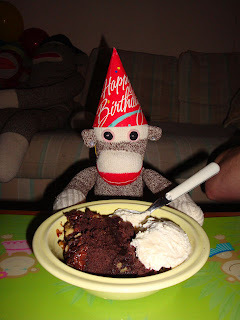 It's a chocolate overload cake from our local grocery store, Publix. There's a brownie layer in the middle sandwiched between cake layers. The icing on top is chocolate fudge. You can probably see why they call it chocolate overload. 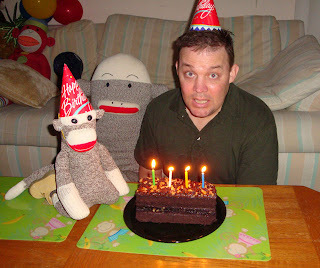 Mark and I are about to blow out the candles, as Gunther eyes up the cake from behind. We made a wish and blew out the candles. Now it's time to dig in! We balanced out the cake with some vanilla ice cream on the side. Here's a closer look at my dessert bowl. It's the perfect ending to a fun day!